If you’re not yet tired of playing DC superhero slots, we’ve got yet another one for you here. The Justice League slot comes from NextGen Gaming, and you’ll find many super heroes here that have already featured in their own slots. There are some additional ones too though, so watch out for those as you play. 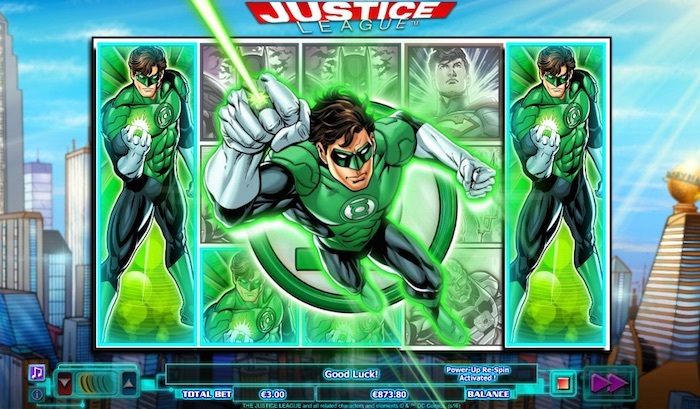 The Justice League slot is a 5 x 3 NextGen Gaming online slot game. it takes place against the Metropolis backdrop, and a whole host of cartoon heroes are featured in the game, including Wonder Woman, Batman, Superman and The Green Lantern. Any game based on comic book characters is going to provide accurate graphics, and this holds true here, too. There is a variety of special features built into the game, so most players who like a bit of depth to their slots should be happy with this one. We don’t think you should be a fan of Justice League to like it, either. It has an autoplay feature with easy-to-adjust settings, so if you’re a player who likes to sit back and watch the reels spin, you’ve got the ability to do just that. The game packs in some excellent graphics. 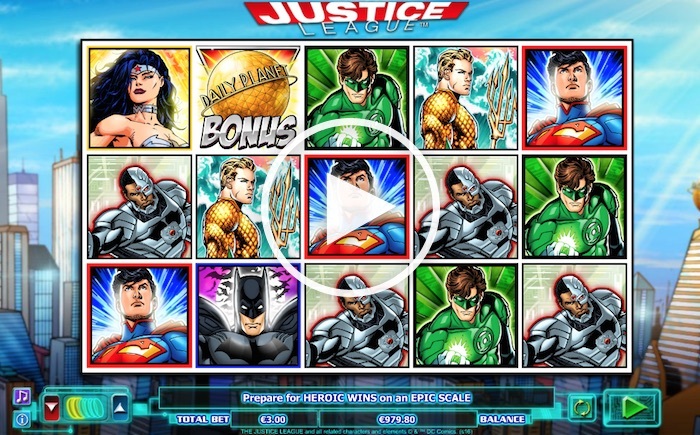 If you put together a winning combination in the Justice League slot, the winning symbols are shown in colour and a line flashes across the screen to show which payline won the prize. Every other symbol fades to grey. If you’ve played other recent slots from NextGen Gaming, Justice League has the same familiar game settings, all below the reels. It makes things easy and you can get on with enjoying the game instead of figuring out how it all works. The latest of the DC Universe super hero slots has seven super heroes appearing among the symbol selection. There are a few others as well, which we’ll come to in a moment. The payout table is spread over seven pages, and is easy to access by clicking on that small ‘i’ below the musical note in the bottom left corner. This explains how much the various characters are worth (you need three of each to win a prize) and how the bonus features work. Okay, the wild comes first, and appears as silhouettes of the character above the word itself. It will only show up on the second, third and fourth reels. Moreover, any symbol can randomly be changed into a wild on one, two or three of those reels with any spin. This is the Team Rescue feature. The Daily Planet globe is the bonus symbol and this too only appears on the middle three reels. This triggers the Attack on Metropolis bonus free spins – 10 of them in all. You can get additional random wilds during these games, not to mention the chance to win more free spins as you play. If you can collect wilds to charge the meter on the screen, you can win more Super Hero Spins. Once you have completed your free spins, you will go through to another free spins feature – the Super Hero Spins mentioned above. The two end reels spin together as Super Powered Reels in this round. The same super hero will take up all the positions on both reels, thus improving your chances of a good payout. You can win more of these spins too if you’re lucky, not to mention getting multiplied wild wins worth up to 10x their usual value. Wow, all good so far. But we have one other feature to share with you. The Super Hero Power-Up Feature. If one super hero appears in every position on the first reel and you get a line win featuring that super hero, the fifth reel will transform to match the first one. Every super hero and every wild in place at this point will lock and everything else re-spins. These free re-spins carry on until no more super heroes or wilds show up on a spin. Despite the game having 25 lines and a minimum coin value of 1p, your smallest bet is 30p. We think this is due to the number of features it offers. The biggest bet is £2 per coin with a £60 total bet. You must play all the lines, too. The top prize value is a little disappointing – offering just 300 coins for five Superman appearances on a payline. However, the bonus features stand a chance of delivering better prizes if things go in your favour. The return-to-player is quite respectable for the game, coming out at 96.501%. We reckon a few free practice spins of this game will reveal how good the Justice League slot is. With lots of special features and the potential to rack up some good wins with them, it reduces the disappointment of a small maximum line prize. The game works well, is designed beautifully and has all the features and perks you could want. Try it today and see if justice comes your way in the shape of a prize.